Rama Amara and Eric Hunter are co-principal investigators of the Emory Consortium for Innovative AIDS Research in Non-Human Primates. Investigators in the Emory Consortium for Innovative AIDS Research in Nonhuman Primates (CIAR-NHP) aim to develop advanced vaccines that provide sustained protection from retroviral infection. In addition, they aim to refine existing "shock and kill" approaches that seek to eliminate the virus from latent reservoirs in people who are infected with HIV, enhancing the possibility of a cure. Researchers will focus their work on simian immunodeficiency virus (SIV) and SIV/HIV hybrid viruses, using the unique resources of Yerkes National Primate Research Center and Emory Vaccine Center. Research programs with nonhuman primates provide an opportunity to understand what makes a vaccine effective in protecting monkeys against infection with the virus. Leading HIV investigators from around the country also will contribute to the consortium. "Emory's HIV/AIDS investigators have been leaders in contributing essential knowledge and tools in the effort to develop preventive and therapeutic options for this challenging disease," says Jonathan S. Lewin, MD, Emory executive vice president for health affairs, executive director of Emory's Woodruff Health Sciences Center and president and CEO of Emory Healthcare. 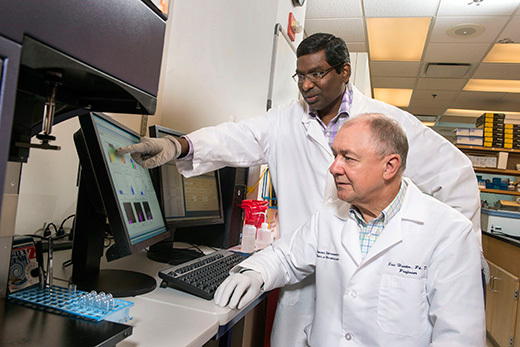 "As the international research community draws closer to an effective vaccine and cure, Emory's research team will use this significant new grant to close the gaps in scientific understanding and develop meaningful outcomes for prevention and potential cure." Scientists already know that by using a particular immune-stimulating agent they can enhance vaccine protection and by using another agent decrease viral levels for an extended time after discontinuing antiretroviral therapy. The Emory-led team has a plan for combining these different pieces of the puzzle, in order to fill the gaps in our knowledge. stimulating the right balance of immune cells and CD4 T cells, which are potential targets for the virus. Emory scientists plan to incorporate newer immunogens into the viral "payload" of vaccines so that antibody responses focus on specific parts of the virus that are important for inducing neutralizing antibodies, as well as other parts of the virus that can stimulate antiviral T cells, which are important because they kill HIV-infected cells. "Generating a long-lasting protective antibody response at the site of HIV entry is key to stopping its transmission and is one objective of our new NIH-funded research program to develop new strategies for preventing and curing HIV/AIDS," says Rama Amara, PhD, co-principal investigator of the grant and professor of microbiology and immunology at Emory University School of Medicine, Emory Vaccine Center, and Yerkes National Primate Research Center. The CIAR will also pursue studies aimed at accelerating the development of a cure for HIV. Using the "shock and kill" approach during antiviral drug therapy, researchers will force HIV to come out of hiding from its reservoirs in the body, which is key to killing the virus. To this end, the team plans to test novel "latency reversing agents" and then combine the best one with immunotherapeutic drugs (PD-1 blockers) and therapeutic vaccines. "We are very fortunate and excited to have such a strong, multidisciplinary team of investigators here at Emory, and around the US, to tackle these critical questions in HIV vaccine development and therapy. This award will allow us to combine multiple novel approaches to work to improve the efficacy of preventive vaccines and approaches to a cure for HIV," says Eric Hunter, PhD, the grant's other co-principal investigator. Hunter is professor of pathology and laboratory medicine at Emory University School of Medicine, Emory Vaccine Center, and Yerkes National Primate Research Center, co-director of the Emory Center for AIDS Research and a Georgia Research Alliance Eminent Scholar. Participating Emory investigators include: Rafi Ahmed, PhD, director of the Emory Vaccine Center and professor of microbiology and immunology at Emory School of Medicine and Yerkes Research Center; Steve Bosinger, PhD, senior research scientist in microbiology and immunology at Yerkes Research Center; Ann Chahroudi, MD, PhD, assistant professor of pediatrics at Emory School of Medicine; Max Cooper, MD, professor of pathology and laboratory medicine at Emory School of Medicine; Cindy Derdeyn, PhD, professor of pathology and laboratory medicine at Emory School of Medicine and Yerkes Research Center; Paul K. Farmer, PhD, research projects manager, Yerkes Research Center; Paul Johnson, MD, director, Yerkes National Primate Research Center and professor of medicine at Emory School of Medicine; Mirko Paiardini, PhD, assistant professor of pathology and laboratory medicine at Emory School of Medicine and Yerkes Research Center; Bali Pulendran, PhD, Charles Howard Candler Professor of Pathology and Laboratory Medicine at Emory School of Medicine, Emory Vaccine Center, and Yerkes Research Center, and director of Emory's Innate Immunity Program; Guido Silvestri, MD, professor of pathology and laboratory medicine at Emory School of Medicine and Emory Vaccine Center, and division chief of microbiology and immunology at Yerkes Research Center; Jens Wrammert, PhD, assistant professor of pediatrics at Emory School of Medicine; and Tianwei Yu, PhD, professor of biostatistics at Emory's Rollins School of Public Health. Drs. Hunter, Ahmed, Cooper and Silvestri are Georgia Research Alliance Eminent Scholars. Shane Crotty, PhD, La Jolla Institute for Allergy and Immunology; Pamela Kozlowski, PhD, Louisiana State University; David Margolis, MD, University of North Carolina/Chapel Hill; John Mascola, MD, National Institute of Allergy and Infectious Diseases, National Institutes of Health; David Masopust, PhD, University of Minnesota; John P. Moore, PhD, Weill Cornell Medical College; Philip Santangelo, PhD, Georgia Institute of Technology; and Francois Villinger, PhD, New Iberia Research Center, University of Louisiana. Funding for this project is from the National Institute of Allergy and Infectious Diseases, grant # UM1AI124436. Additional funding support will be provided by the NIH Office of Research Infrastructure Programs, grant # P51OD011132, to the Yerkes National Primate Research Center.